This book has been completely revised and updated. It is filled with advice and suggestions on how to successfully raise debt financing for your business. It covers 261 loan programs, sub-programs and initiatives in both the public and private sectors. It includes 593 contact addresses, phone and fax numbers together with websites, where available. It provides you with a brief history of banking and describes the structure of the Canadian banking industry. It tells you about the types of loans which banks offer. The chapter on loan-based crowdfunding has been updated. 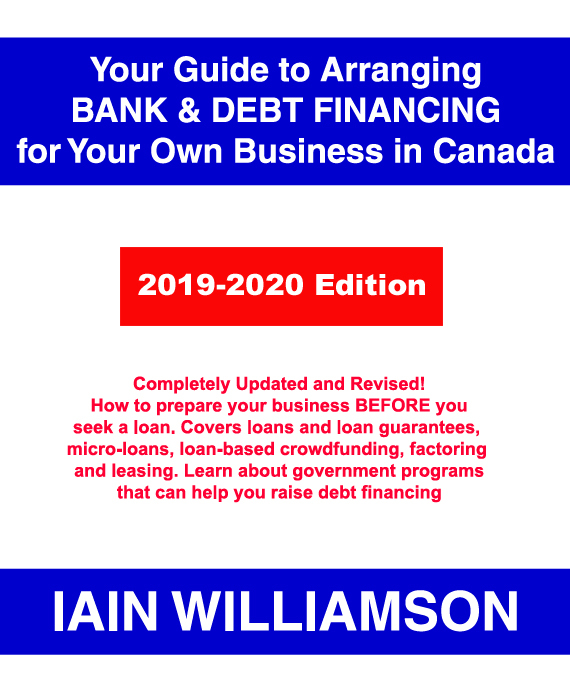 This 2018/2019 Edition has also been revised to cover loans and guarantees provided by the federal, provincial and territorial governments and their agencies or private sector partners. It describes loans for exporting and for businesses involved with agriculture, agrifoods, aquaculture and fisheries. It also covers micro loans and loan circles which you can access through a number of non-governmental organizations. This book also shows you what to do before you approach your bank manager in order to present your business in the best light. It tells you how your bank manager evaluates loan applications. Learn how to factor your accounts receivable or use chattel mortgages and real estate mortgages. You are provided with an updated chapter on export financing. Leasing can help you reduce cash outlay and is considered as a form of debt financing. Find out the advantages and disadvantages. Iain writes from firsthand experience which he shares with you. This book is essential reading if you are seeking debt financing. The Emergence of "Modern Banking"
Now that There's an Attempt to Bring Big Banks to Heel Does it Mean You Can Get a Loan More Easily? What is Meant by Leasing?